As usual, the CHANEL Cruise 2015/2016 show was an impressive spectacle, buzzing with the explosive energy of its host city, Seoul. The makeup and hair was an eccentric medley of K-pop, Disney inspirations, with a nod to majestic lost empires. Once again face painting magician, Tom Pecheux brought his A-Game, pulling all the tricks out of his metaphorical makeup hat. At first glance, it seemed like models had tiny rectangles drawn just below their lower lash lines. But in reality, this was some cunning optical trickery in the form of intricately snipped false lashes placed directly beneath the centre of the eye. Coupled with delicate, floating, double-lined eyebrows and white liner on the inner eyes, models looked like they’d walked straight out of a manga cartoon and landed in Karl Lagerfeld‘s Asian wonderland. A little further south, perfectly painted mouths glowed luminous red. The ultimate in wearable summer lipstick shades, fresh off the runway. Whilst they may have seemed like a huge nod to Star Wars (Princess Leia goes to Korea? 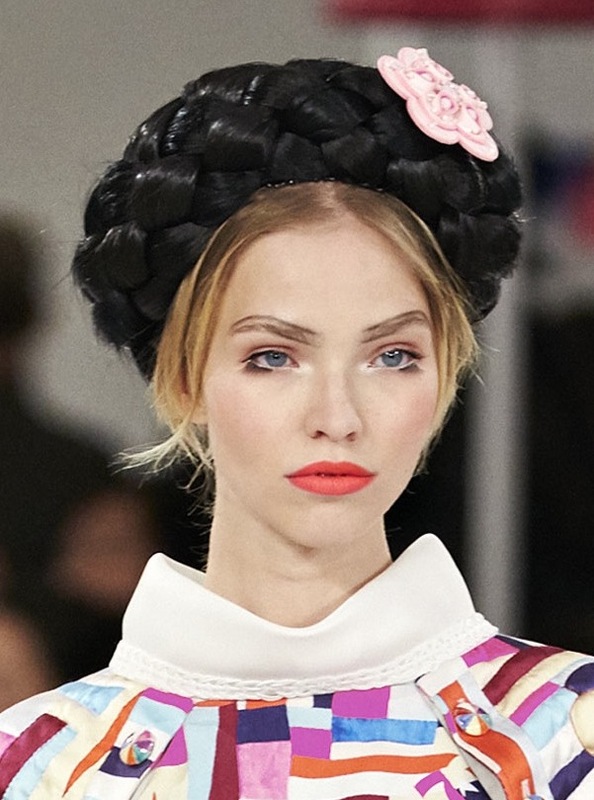 ), the thick braided “hats” created by veteran stylist, Sam McKnight were in fact a play on “traditional hairstyles worn by Korean nobility.” 120 plaits were handcrafted from synthetic, black hair and set in place using bees wax, creating “cute Minnie Mouse ears” and regal coronets. The models’ natural hair was simply scraped in to a contemporary ponytail below the braids. Nails were painted with a slick of black lacquer, giving these cutesy dolls a mischievous, rock ‘n’ roll edge. As extreme as the Chanel runway beauty looks may seem, every season there’s always the odd element here and there that makes it in to the real world (note: the Sixties cut crease seen at the Paris-Salzburg Métiers d’Arts show, that’s dominated Instagram makeup tutorials ever since). No doubt, tiny, down-sized false lashes, poster paint lipstick hues and structured brows are set to be big players. What do you think? Would you try this look?